A discomfort, sort of a nagging feeling, starts in your stomach area then spreads through your body. "Is this as good as it gets? Have I made the right life choices? You sense something missing in your life. But you can't quite put your finger on it. You recall unfulfilled dreams and aspirations that you set aside as you got on with the job of living. "Follow those dreams! Don't settle for this! You're worth much more!" "Be quiet!" you say. "I can't! It's too late! If I did what I really want to do, I'd lose what I have now." And so does the real you. When people become aware that something is missing, or that their lives have fallen short of their expectations, it's always because the "tools" they've relied on to get through life no longer work. Something much more powerful is needed. I'd like to show you that tool ... the one that will recharge your life and reawaken the voice of your soul. Hi, my name is Sonia Choquette, and I'm a psychic. Please don’t be alarmed by the word ‘psychic’. It simply means I am more in touch with my mind, intuition, energy and soul. Since I was 12 years old, people have sought me out because I know how to use this remarkable tool ... and how to teach others to use it. You'll be aware of energy. You'll be conscious of vibration traveling through space. You'll feel people's thoughts. Feel their souls. Even be able to sense events in the process of becoming. You'll know when things are out of balance before your five senses indicate it. You'll sense when there is trouble. And you'll have impulses that direct you and tell you when to move forward and where your life will have openings, opportunities, and positive experiences. Back in 1986, three years after my husband Patrick and I married, we decided to buy a home. It was a major decision so we looked and looked and within a month we found exactly what we wanted. It was perfect. It was two stories. It was like a little Victorian home and had a beautiful double-lot yard. Price was right. They took care of it. It was clean. It was excellent. Before I tell you about the strange thing that happened, I need to explain something. You see, I travel through life on a "psychic pathway." On this pathway, I have the aid of a powerful "psychic" tool that protects me from harm and points me toward ever-growing situations of joy, love, and fulfillment. While we can't see, hear, or touch radio waves, we know they exist because we can pick up these signals and hear them clearly on our radios. But there's another set of invisible waves of energy ... signals being transmitted from your soul. Your soul — often called your "higher self" — broadcasts at a frequency that can only be picked up by your sixth sense. These signals — which foretell events moments, hours, even days and weeks before they actually take place — are in the air surrounding you at this very moment. They're always there. Just tune in, and you'll know what's going to happen. You already have this amazing ability! When women get these signals, they call it "women's intuition." Men say they get a "hunch" or "gut feel." Inventors and scientists describe it as a "flash of brilliance." Religious people claim it's "divine guidance" — the "voice of God." Athletes who tune into this wavelength say they're in the "zone." Others call it "premonition," "insight," "déjà vu," or plain "intuition." My soul only speaks to me with my best interest at heart: to protect me from harm and point me in the most advantageous direction. Unfortunately for most people, the signal is faint — often heard with suspicion, and rarely acted upon. In my case, the signal comes in loud and clear, and I can pick up vibes at will — on any subject, and about any person that I'm standing next to or talking to. Even on the phone. YES, I want to reawaken the voice of my soul and activate the natural psychic ability I was born with, so that I can use it to guide my life and make the best possible decisions. If you're interested, I can easily show you how to reactivate your sixth sense. Yes, I did say "re-activate," because as I said, it's a tool that you were born with. All you have to do is dust off the cobwebs and within two weeks, it's up and running. That's all; just two weeks. And when it's activated, you'll feel more confident in everything you do and every decision you make. You'll experience a level of "knowing" that can't be put into words. Something strange happened on July 12th, just three days before we were supposed to close the deal. I got a bad vibe. "Something is wrong with that house," I said to myself. I could feel it and there was no mistake. If you're guessing that I got cold feet you'd be wrong because cold feet (which is fear) is a tightening that starts in your stomach, then constricts your heart and blood vessels, travels up your spine and neck to your face and head, down your arms. Everything tightens. Your muscles ache. You feel restricted and drained of energy. It's an "expansive" sensation as your heart opens and radiates. Your face glows. Your hands and feet get warmer. Every molecule in your body loosens up and expands and you feel like shouting, "YES!" You experience a "certainty" — supported by an unwavering conviction that comes from deep inside you. It "feels" right! That's what happened to me on July 12th. I suddenly had these bad vibes from the house and I knew without a doubt that we should not move in. That night, Patrick came home after being out with friends, and it was late, like 11:00 at night. I was tapping my feet when he walked in the door, and I said, "I don't want the house." He looked at me and said, "What?!" I said, "I don't want the house." "Oh Sonia ... you have railroaded every single person in this process. We are buying the house!" "I don't want the house. You can't make me move into that house!" He was silent for a while, then said, "OK Sonia, you got us in it, you get us out of it." So, I called the realtor and said, "I can't buy this house." And they said, "What? Why? It's a beautiful house. It's a perfect house. In a great neighborhood. It's a steal of a house." "I have bad vibes," I said. "I cannot move into this house. In fact, I have such bad vibes, something is wrong with this house." So then they had a decision to make. They could either deal with the loony tune or just say fine. These were not terribly imaginative people, so when I'm saying I'm a psychic and I have bad vibes and I am not going in there, that was too much for them to cope with. And they said, "Fine, the house is so good that we can easily sell it." And so we got out of it. Three weeks later, we had torrential rains that lasted for all of August. If you lived in Chicago you would remember this. That house flooded in the basement and the first floor and was completely destroyed ... just three weeks after we would have owned it. So, what does living on the psychic pathway really mean? It means living by your own authority. One person is the boss and the rest of us are followers. And when you step out of that, you will be confronted. You will be challenged. You will possibly be told you can't do that. You will be questioned. But when you activate your sixth sense, you pass through a gateway to a world in which you live by your own authority and take greater responsibility for what you need to be happy. Now I can tell you, having crossed that threshold and living on the other side of that gateway, it is great! No longer are you stuck in belief systems that say you have no power and authority, you have no ability to create or you have to follow the rules. You're free ... living life on a level that few people can fathom. When you walk through that gateway to the psychic pathway, you'll say, "Oh, I remember this ... I remember who I am. I am a spiritual being and I can create a life that works for me, and no it doesn't go with the ordinary world rules." And it doesn't bring ordinary results either. Open your sixth sense. That's all. Just open your sixth sense and hear the voice of your soul. You don't play Chopin the first time you're at the piano. And when you enter the psychic pathway, you won't necessarily be an expert the first day. You start slowly. You build up to it. However, you will have experiences from the first day. And within two weeks, you'll notice a lot of changes. Sure, listening for advice from your soul will seem strange at first. But the first time that it helps you — and logic can't explain what happened — you will be convinced. "It was a Sunday afternoon, and I was involved in a do-it-yourself project, and I couldn't find my adjustable wrench. I checked everywhere and was I growing frustrated. "With nothing to lose, I decided to try one of Sonia's techniques. I closed my eyes and within two minutes, I saw a glimpse of my wrench in my mind. It was like watching a movie. A 3-D movie. I could see it sitting on a shelf, in a dark place, angled to the left, surrounded by what looked like polka dots. That made no sense. "The picture became clearer, and I suddenly knew where it was. "I went into the bathroom in our bedroom, opened the cupboard under the sink, and there it was, sitting angled to the left, on a shelf lined with paper that had a pattern of small roses, which from the distance, looked like polka dots. "The spooky thing was that I had already checked this cupboard earlier. Weird." As you begin to experience a growing number of wonderful things — that lack any logic explanation — your trust will grow, and you'll realize that you're in possession of something so precious that you'll shudder, afraid to lose it. But you won't lose it. In fact, each day it will become stronger. Don't take my word for it. Allow me to prove to you that you can reawaken the voice of your soul, and, that it's worth doing. I've recorded my techniques for activating your "sixth sense" and I call the program, Your Psychic Pathway. EXCLUSIVE TO THE CD SET - A Pendulum and Axis Grid that act as a conduit (a way to have a conversation with the higher self) and will accurately answer any question that you ask of it. Listen to Your Psychic Pathway, and pass through the gateway to the real you — and the satisfying world that awaits you as travel down the psychic pathway. P.S. Should you accept this offer? I can't answer that. Only the voice of your soul can. This voice is very subtle but ever-present. It's waiting ... wanting to participate in the guiding of your life to the best possible outcome. Listen to it. Feel the "vibes." Follow your heart. It will always steer you in the right direction. I hope the answer you hear is the same answer that I hear. I want to reawaken the voice of my soul and activate the natural psychic ability I was born with, so that I can use it to guide my life and make the best possible decisions. 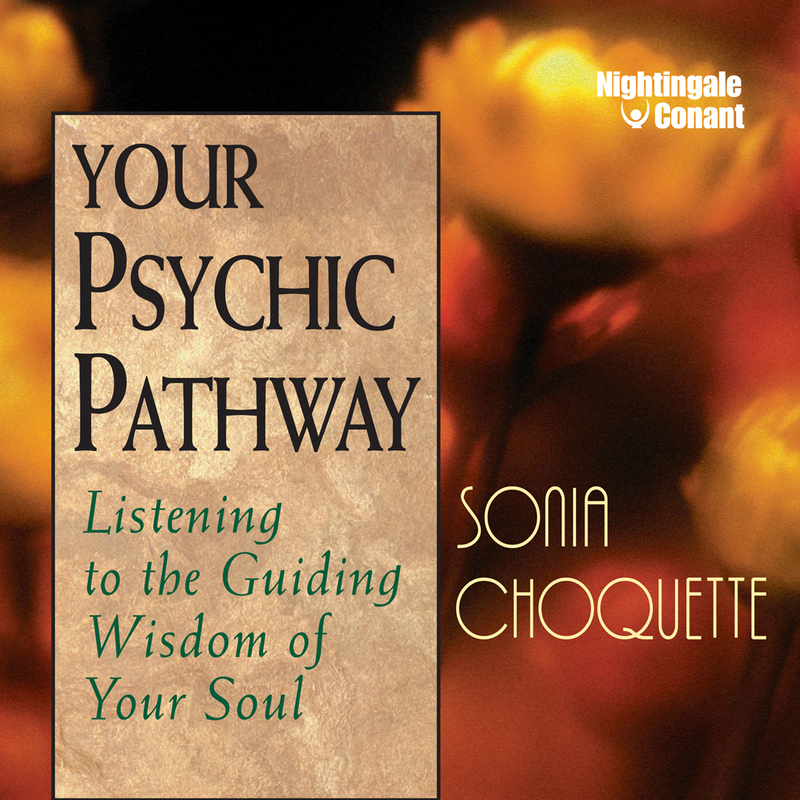 Please send me Sonia Choquette's audio program Your Psychic Pathway, at the special price below. - I can select one of two ways of ordering.